Joel Applebee, a former assistant for four years at Derby before he took the Mill Valley head coaching position, saw firsthand Randy Dreiling’s coaching ability during his very successful tenure at Hutchinson. When Dreiling took the St. Thomas Aquinas job several months before the 2014 season, Applebee texted Dreiling and told him congratulations. Applebee, now entering his sixth season with the Jaguars, was very excited by the move. Last fall, in Dreiling’s coaching debut, Aquinas defeated Mill Valley, 34-24. The early season victory helped propel the Saints to a six-win improvement to a 9-4 finish and Class 5A runner-up finish to Bishop Carroll. Applebee wasn’t surprised by Aquinas’ quick turnaround. This season, Aquinas, with eight offensive and six defensive starters back, and Carroll are considered the top-two teams in 5A. The Saints have finished runner-up three times in school history, ’85, ’08 and last year. Mill Valley, known for its high-octane spread offense, is 36-15 under Applebee, but slipped back to 5-5 last season. This year, the Jaguars have Applebee’s most experienced squad with eight offensive and nine defensive starters. Aquinas plays host to Mill Valley on Friday. Both teams return star talent on each side of the ball, including Saints quarterback Karter Odermann and Mill Valley signal caller Logan Koch, both seniors. Aquinas running back James Cosentino (1,296 rushing yards) will not play Friday because of injury; Dreiling said the senior is week to week. Cosentino had a season-ending leg injury late in ’14. In 2013, Aquinas finished 3-7 and lost 38-6 to Mill Valley in the first round of the playoffs. The next season, Aquinas started with the 10-point victory. The Saints went 4-2 in games decided by 14 points or fewer in ’14, including a 42-41 classic versus Shawnee Heights in the sub-state championship game. The Saints went 0-3 in games within 14 points in ’13. In 2013, Aquinas averaged 28.7 points per contest and allowed 25.6. Last year, the offense bumped to 31.2 points a game and the defense allowed 22.9 a contest. It marked the best offense since 2010. Dreiling called it a “challenge” to form his team from the first day of 2014 summer camp at Pittsburg State University to the first game. “The players played positions they had never played before, and they did remarkably well,” Dreiling said. Dreiling said Odermann has done a “remarkable job” of leading the Saints in the offseason. Odermann gathered the team weekly to throw and run the option game and earned a captaincy. He ran for 1,072 yards and threw for 795 last year. As well, Dreiling said defensive end Angel Dominguez has “really stepped up” his game and should be difficult to block after a four sack season. Senior Chris Schilling (five INTs) is a solid player. Mill Valley has continually ranked among the top offenses in 5A under Applebee, averaging 42.5, 35.2, 49.4, 35.1 and 33.2 points per game. The Jaguars have several potential running backs in an inexperienced backfield, but junior Tristan Milne should receive the bulk of the load. Christian Jegen, an outstanding two-way player with a 3.8 GPA and high character, had two punts for scores, and had 91 offensive touches for 1,140 yards. The defense permitted 10 points a contest in a 10-1 season in 2013 and 23.5 last fall. 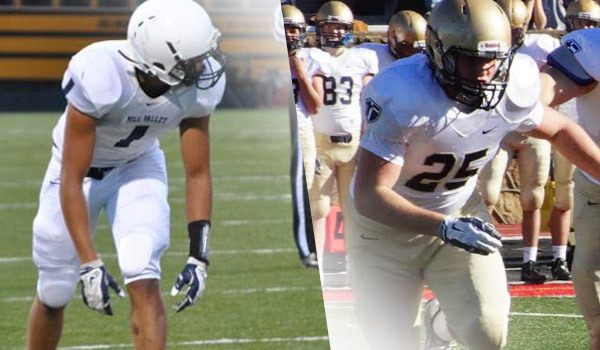 Mill Valley returns its top two tacklers, and Applebee said senior Anthony Brown (team-high eight TFLs) has impressed in fall camp and has a high motor and intensity. Applebee said the Jaguars have made some weight room adjustments to improve athleticism and strength.